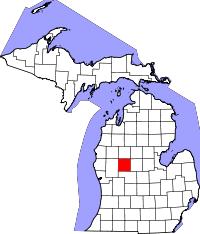 Big Rapids, the seat of Mecosta County, is where the County Clerk and genealogy research area is located. The area is less formal, offering standing room at the service counter only, rather than a seated area. Up to four vital records researchers are permitted at the counter simultaneously. To contact the Clerk's office to schedule a research session prior to visiting, individuals can email the office at MCClerk@co.mecosta.mi.us. Divorce, birth, and death records are listed from 1867 to the present, and marriage records begin in 1859. Access to birth records dated fewer than 100 years ago is restricted to confirmed relatives of the registrar. To order physical copies of records without visiting the office, which is open on Tuesdays, Wednesdays, and Thursdays from 9:00AM until 4:30PM, the County Clerk recommends the VitalChek service, and they also list an application that can be mailed in.